The following blog was sent over to me by Bailey from Redfin. I thought this was layered with lots of good recommendations for practicing, playing, and recording music at home. I hope you find it useful! · Reduce door gaps: Adding a door sweep on both the inside and the outside of the door can help reduce sound travel. · Cover the windows: You can hang thick curtains over windows, or seal leaks with budget-friendly foam weather stripping or professional-grade acoustical sealant. · Line heating/cooling ducts: Don’t forget to line your heating and cooling ducts with soundproofing duct liner to further reduce noise. · Bring in some textiles! Cover the floor with carpeting or thick rugs, and even consider hanging some material from the walls. · Install soundproof materials: There are all kinds of soundproofing materials out there, some more effective — and more costly — than others. You can install soundproof curtain around the perimeter of the room, tack up vinyl or install acoustic insulation. · Avoid cheap alternatives: Considering a cheaper option like adding mattresses or egg crates to the walls? Skip them. Not only are they unsightly, but they are ineffective, as well. · Avoid shared walls: Play your musical instruments in a room that doesn’t share any walls with your neighbors or position yourself closer to the outside walls. · Add a false ceiling: You can consider adding a false ceiling to give some relief to the upstairs neighbors and replace your hollow doors with solid, heavy core ones. If you hit a major chord and notice some shaking picture frames, vases or other objects, remove them or secure them. · Consider a shed or garage: If you live in a 2,000-square foot house and want to keep your drums from waking the baby, consider moving your equipment to the other side of the house, going out into the garage or renovating a tool shed in the backyard. · Cancel feedback from electrical equipment by putting items like amps as far away from microphones as possible. · Don’t completely eliminate all sound reflection: Leave a few spots open and treat them with diffusers so the natural frequency of your music isn’t lost. · Think about highand low-end sound absorption: Most of your reflection treatments will tackle the high frequency reflections, but you’ll want to install a few bass traps in order to dampen the sound for lower frequencies. · Plan for power: Be sure to have plenty of outlets, and make sure all of them are the right wattage for your equipment. · Think seasonally: When the July high temperatures hit, will the sound of the air conditioning clicking on and blowing into your studio become background noise? · Arrange it right: Even if you’re playing solo, be sure to arrange your studio to accommodate the number of musicians who could play at one time in the space. 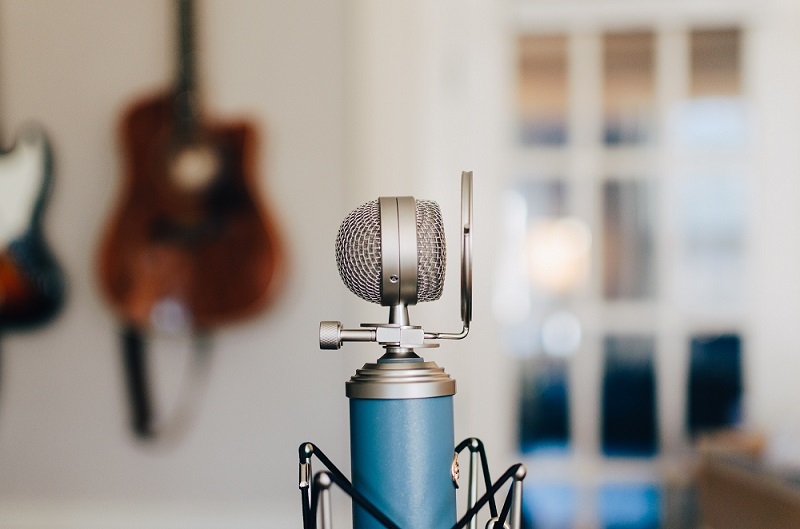 If you host other artists down the road, this will make it easier to plan out and arrange your recording stations to maximize the best sound for the number of people who will be there at once. · Maximize your equipment: When dealing with small spaces, you also should examine how to maximize your equipment so that you have more room and fewer things for sound to bounce off of. It’s time to embrace the digital age! You can use digital instruments to keep the clutter to a minimum and, when appropriate and affordable, try using compact equipment.